Rescuers in Germany reduced the number of people they were searching for in a building collapse from nine to two, a fire department spokesman said late Tuesday. Seven people who earlier had been reported missing contacted authorities to say they were safe, the spokesman explained. The two remaining victims are men missing from a residential building heavily damaged when another building collapsed, said the spokesman. The spokesman said it was too dangerous to enter the residential building and that the Cologne fire department was working on stabilizing the structure so rescuers could enter it later. The building, which housed the city’s historical archive, collapsed, damaging two other buildings — possibly because of nearby construction underground, CNN’s Ben Brumfield reported from the scene. The building itself was an unremarkable 20th century structure, but the archives it contained were very valuable, said Brumfield, who has done research there. “Some of the earth underneath the building that collapsed slid into the construction space, which caused a hole under the building,” he explained. “The building fell literally into that hole and fell forward into the street. Firefighters were using dogs to help search the rubble, and police said heavy-lifting equipment was on the way, he said. Rescuers do not know if anyone is alive in the rubble, he said. As many as 100 emergency vehicles were on the scene, he added. iReport.com: See photos of the rescue scene The collapse of the main building tore the facade off a neighboring structure, revealing the rooms inside, photos from the scene showed, Rescue efforts are ongoing and are expected to last until at least midnight local time (4 p.m. Eastern time), a fire department spokesman told CNN. The spokesman did not identify himself. Police are evacuating all the buildings in a 150-meter (yard) radius around the scene of the incident, including two schools and a retirement home housing 76 people, Brumfield said. There will be no classes at the school Wednesday, he added. 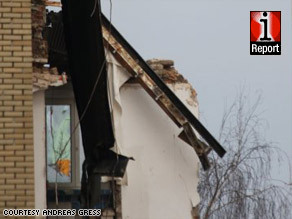 The building did not collapse quickly, said Carlo Schlender, a reporter for German TV station RTL, a CNN affiliate. That gave people the chance to flee. There were “a lot of noises before (the collapse). Most of the people could hear that something was wrong and escaped from the scene,” he told CNN International’s “iDesk” program. The fire department confirmed that everyone in the archive managed to escape before the collapse of the building, but thought some people working and living in buildings next door were not able to escape. The city is building a new subway line under the buildings that collapsed, Susanne Motter at the Cologne tourism bureau told CNN. It is not clear if the underground construction played a role in the incident. But Gudrun Meyer, a spokeswoman at the Cologne Transportation Department, denied construction was taking place below the collapsed structure. “This construction is not happening directly under the building, nor am I aware of any construction which might have caused this,” she told RTL. The main building which collapsed is the Historic Archive of the city of Cologne, which houses documents up to 1,000 years old. Andreas Gress, a CNN iReporter who lives near the building and passes it every day on the way to work, said he saw nothing unusual Tuesday morning at 8 a.m. “People were working like every day,” he said.